MACUCC: SPOTLIGHT: Bless the Farm; Bless the Farmer. Bless the Flip-Flops, Bless the Feet. MACUCC: SPOTLIGHT: Bless the Farm; Bless the Farmer. Bless the Flip-Flops, Bless the Feet. SPOTLIGHT: Bless the Farm; Bless the Farmer. Bless the Flip-Flops, Bless the Feet. 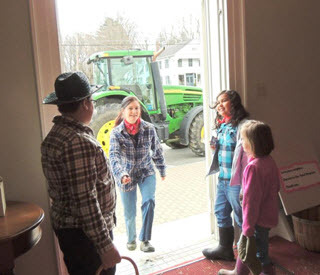 The blessing of the farms service this past spring brought members, friends, neighbors, and tractors to First Congregational Church of Sheffield, United Church of Christ. Big green farm tractors lined the street outside the church as the congregation celebrated and thanked the farmers for the essential role they play in providing fresh local produce, dairy and meat to the community, and for being stewards and guardians of the land. "Sheffield is home to many farms and this service was an expression of who we are and our identity," said Pastor Rev. Jill Graham. "We wanted to give God thanks for the joys and stamina that have been presented to us as stewards of this earth. But we also prayed for guidance as we entered a new season of growing, that we may work the land respectfully, manage herd and flock with care, and love all of creation." The service was both light-hearted and spiritual. During the musical celebration, many songs that are familiar but not necessarily heard in church each week -- like "This Land is Your Land" -- were played (with lyrics that reflected the Southern Berkshire landscape and farming community). Even "Old MacDonald Had a Farm" was sung, but the names of the town's real farmers replaced Old MacDonald and 'had' was changed to 'has' so the lyrics became "'Farmer X' Has a Farm." The service got serious though when it was time for the blessing. During the Liturgy, the people prayed for the coming season, and asked for blessings upon the seeds, the richness of the soil, the rain, the herds and flocks, and the orchards and fields. Finally, the farm families were blessed so that God's love, respect and tender care may be reflected in all they do. "As a rule, people take food, and therefore farmers, for granted," said June Wolfe, a member who owns a small CSA farm and who drove her little tractor to church. "It was nice to be appreciated, especially since we were having a tough spring. The blessing made me feel more positive about the season." Lakeville United Church of Christ wanted to come up with a special worship service to celebrate the end of the school year. The pastor, Rev. Greta MacRae, also wanted the youth to remember church throughout the summer, even when they were on the beaches or at the pool or even sitting under a tree in their backyard. With a Blessing of the Flip-Flops, children could be reminded of their Sunday school teachings every time they looked down at their feet. "This actually turned out to be a very moving experience, because we anointed feet as well," Greta said. She started her sermon with a line from a Dr. Seuss book, "Left foot, left foot, left foot, right..." but then took a detour out of the The Foot Book and into the Bible to relate the story of the woman sinner who anoints Jesus' feet by washing them with her tears and drying them with her hair. During the blessing of the flip flops, and feet, Greta explained that in that moment the woman lets go of her shame and accepts forgiveness, moving into the light of God's love by accepting the help Jesus has offered. She wanted the children, and congregation, to feel that love every time they looked down at their own feet. The deacons, and the children were all involved in the anointing. They started with a prayer written for this special service: God, your son Jesus wore sandals. Back then it was a blessing to have any shoes at all. Create in us a sense of gratitude for simple shoes that make a joyful noise on our feet. Jesus, you accepted the blessing of a woman who had been filled with shame for the sins she had committed. You let her anoint your feet and bathe and dry them with her tears and hair. Remind us always that we need not be ashamed, that your forgiveness washes us clean. Holy Spirit, you move around this world on flying feet. We ask, loving God, that you bless these flip flops and sandals. As we move into God's gift of the season of summer move with us. Bless our steps. Make our days holy. Amen. "It was a very sacred moment," Greta said. "The kids were still 'kids' so they were glowing with excitement, but taking it seriously." "Our church strives to embody the word of Jesus in each of us so when we leave the building on Sunday, we have a 'body memory' to take home with us so we can be reminded and feel Jesus during the week," she said. And with the blessing of the flip flops, the children -- and adults -- will know Jesus is with them every step of the way.